MG University CAP 2015 allotment schedule has been published. As per the schedule, the provisional rank list and trial allot is schedule to publish on 12th June 2015, while first allotment will be published on 20th June 2015 at www.cap.mgu.in, official website of CAP. The allotment timetable will guide the students and parents to know the important dates regarding the 2015 CAP admission process. Scroll down to know about the MG University CAP 2015 allotment schedule. Mahatma Gandhi University, Kottayam one of the most prominent University in India has published the CAP 2014 allotment schedule. As per the schedule published by the University, the online availability of application forms and prospectus will start from 28th May 2015. Students who wish to pursue their higher education with the university can register online from 7th June 2015. As per the schedule, the provisional rank list and trial allot is schedule to publish on 12th June 2015, while first allotment will be published on 20th June 2015 at www.cap.mgu.in, official website of CAP. As per initial schedule, the classes will commence on 15th July 2015. After the trial allotment, students will get ample time to modify, rearrange, add and delete options. MG University has adopted the Centralised Allotment Process (CAP) during the academic year 2010-2011 which enables the applicants to submit only one application online for admission to any number of Colleges/Programmes. Opened for those students who have completed their plus two course, this Centralised Allotment Process (CAP) helps the applicants to track the status of their applications from time to time during the admission procedure. CAP is an internet based single window system which is proposed to give allotments to the various academic programmes offered by the Mahatma University departments and its affiliated colleges. Other than simplicity, transparency in Centralised Allotment Process would enable the candidate to choose courses according to his/her interest. Candidates who wish to pursue their higher education from M G University can download the prospectus from the official website from 28th May 2015. CAP is aimed at candidates to apply for Government, Aided and Unaided and Constituent colleges run by Mahatma Gandhi University. 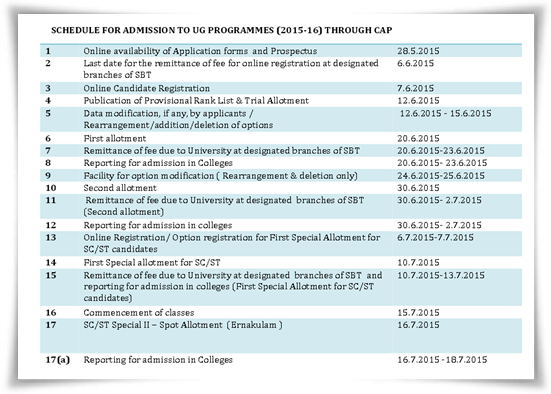 The important dates of the M G University CAP schedule 2015 are given in a null shell. All the seats in government colleges will be filled through CAP, 70% of the seats in aided colleges, while 50% in unaided colleges will come under the single window system (SWS). The Mahatma Gandhi University CAP 2015 allotment schedule can be downloaded from here. Mahatma Gandhi (MG) University CAP UG 2015 online registration procedure, Degree CAP degree admission 2015 for UG courses window 2015 -2016 (CAP) centralized allotment process is also mentioned here. M G University, Kottayam has invited application for admission to UG Degree courses for the academic year 2015-16 in the affiliated Arts & Science/Constituent Colleges of the University. The online availability of application forms and prospectus is 28th May 2015.